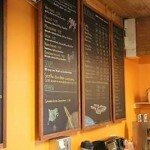 In addition to the best tasting coffee, we also have some of the best prices in town! Come by and compare not just how much better our drinks taste, but how much kinder to your wallet they are! We serve 100% organic, Fair Trade, shade grown coffee, and milk free of added hormones. We use locally roasted beans from Tony’s Coffees & Teas, always “ground to order”, and delivered direct from the roasterie in vacuum-sealed bags. For non-dairy alternatives we have Soy, Rice, and Hemp milks available. We are a vegetarian coffeehouse offering many vegan options serving made-to-order sandwiches, open-faced ploughmans, and vegan & gluten-free soups, as well as bagels, pastries, nut-free granola, and other items at reasonable prices. All our pastries are delivered daily from local vendors including donuts from Mighty-O Donuts, bagels from Blazing Bagels, and croissants, scones, cookies, and more from Little Rae’s All Natural Bakery. 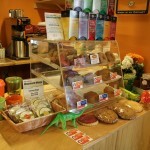 We also have Gluten-Free cookies from WOW Bakery and Vegan & Gluten Free bars from NuFlours Bakery. 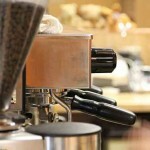 In addition to our delicious coffee-based drinks (such as Latte, Mocha, Americano, Espresso, Drip) we offer a variety of other beverages including Cold Brew, Green Tea Lattes (made with real matcha – no icky additives), Loose Leaf Tea from Friday Afternoon Teas, Iced Tea, Chai, Italian Sodas, Hot Chocolate, Steamer, Fruit and Coffee-based Frozen/Blended Drinks (we call them Eskies), and assorted Juices. Specialty Drinks. 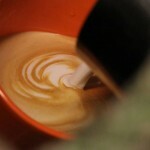 We are well-known for having some of the most unusual (and delicious) flavored lattes and mochas around. Come by and try one of our specialty “geek” drinks named in honor of some of our favorite sci-fi/fantasy inspirations. We dare you to try the Mudder’s Mocha or the Iocane Latte! We also feature classic seasonal drinks (when available) including Hot Apple Cider (real cider, not a powdered mix) and Egg Nog Lattes (made with real egg nog, not a syrup flavor).